I know what you’re thinking: It’s just Tetris, right? Hasn’t this game been around for 30 or 35 years already? Why are people freaking out about Tetris again in the year 2018? 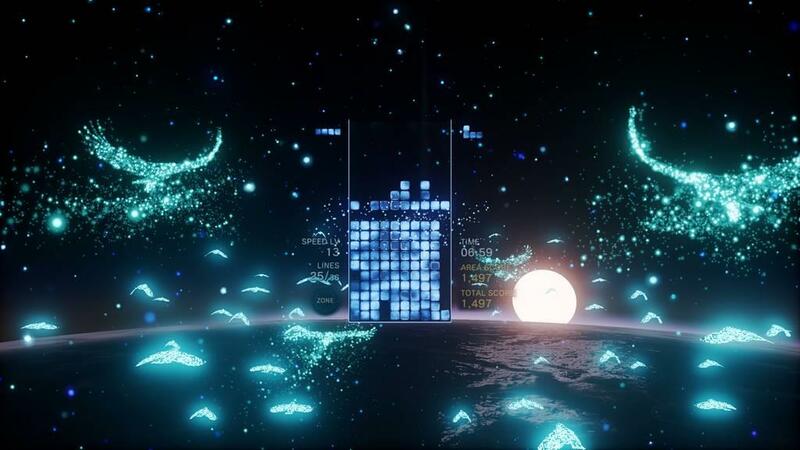 Tetris Effect is what you get when you take good old fashioned Tetris gameplay and marry it to the interactive sound design of game developer Tetsuya Mizuguchi. 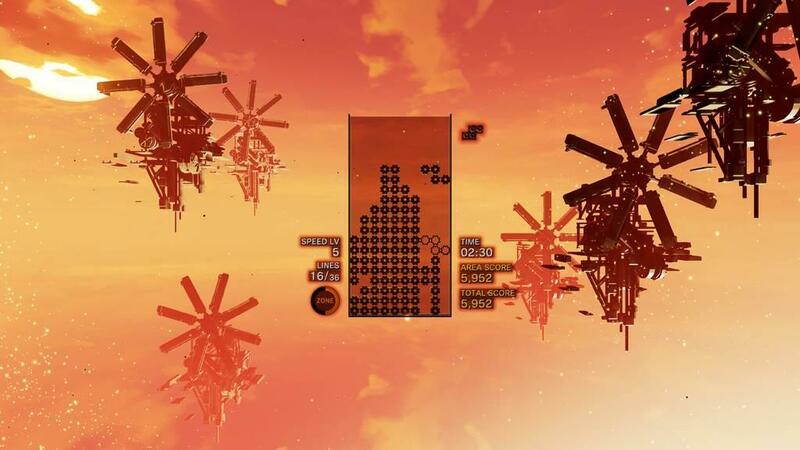 The Tetris part of Tetris Effect is handled well: “tetrominos” are the four-block shapes that cascade randomly, one at a time, down into a rectangular cup. You spin these these tetronimos clockwise or counterclockwise and fit them together as seamlessly as possible. You place the L-shaped block on its back. You fit the Z-shaped block next to it. You spin the T-shaped block to fill an appropriate gap. You bring it home with the straight-lined tetronimo, creating a solid, unbroken wall of blocks from the left wall to the right, clearing those lines off the board. Tetris, by itself, is a perfect puzzle game. 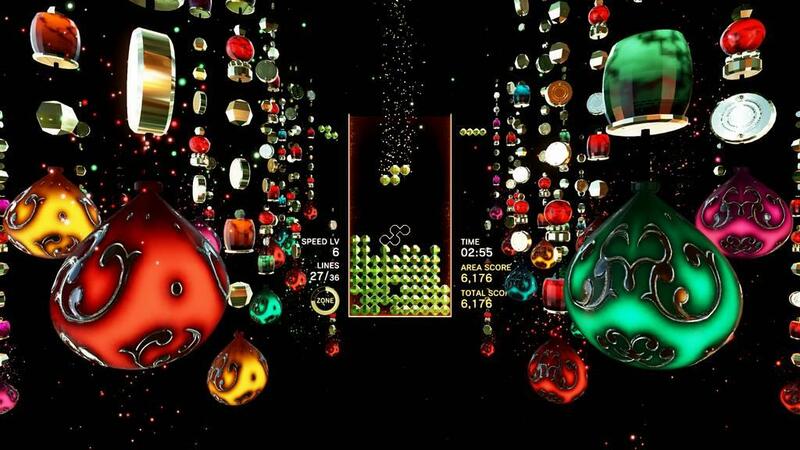 Where things got meta starts with the title of this one: Tetris Effect. 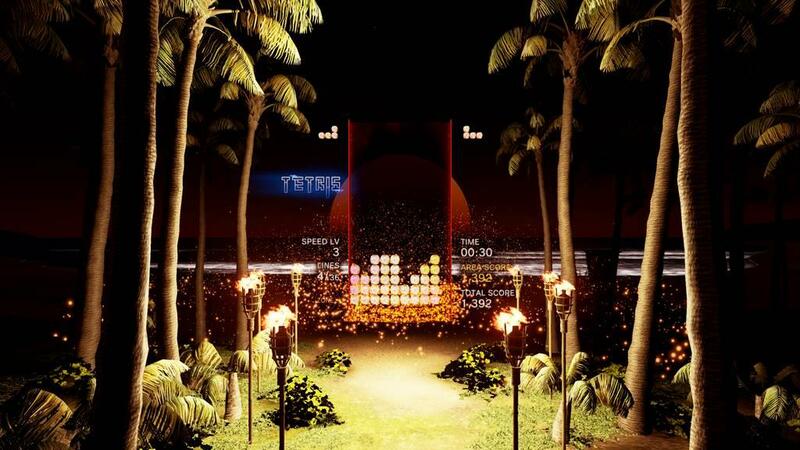 I can’t tell you if it’s a clinically diagnosable condition, but the “Tetris Effect” is when you’ve been playing a lot of Tetris and, after shutting off the game, your mind still imagines it’s seeing tetrominos cascading down your vision. It’s when you look around at the different physical or metaphysical elements of your life and begin fitting them together in tightly assembled block formations. It’s when those four-square blocks start infiltrating your dreams. 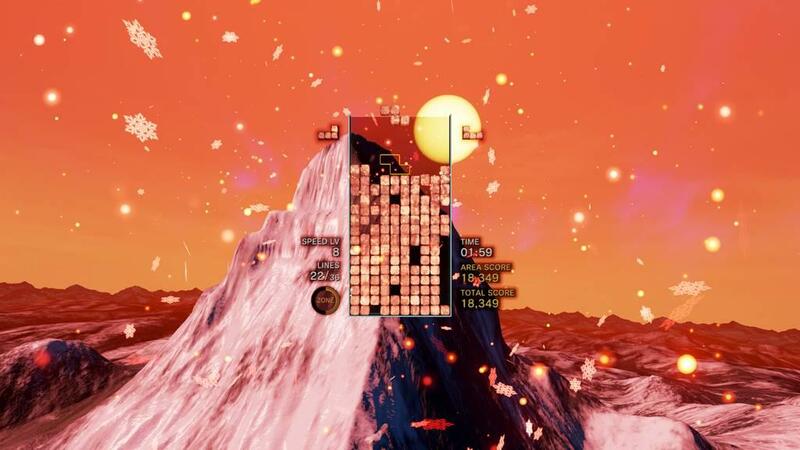 That’s the “Tetris Effect.” It’s almost like screen burn, but the pieces keep moving. 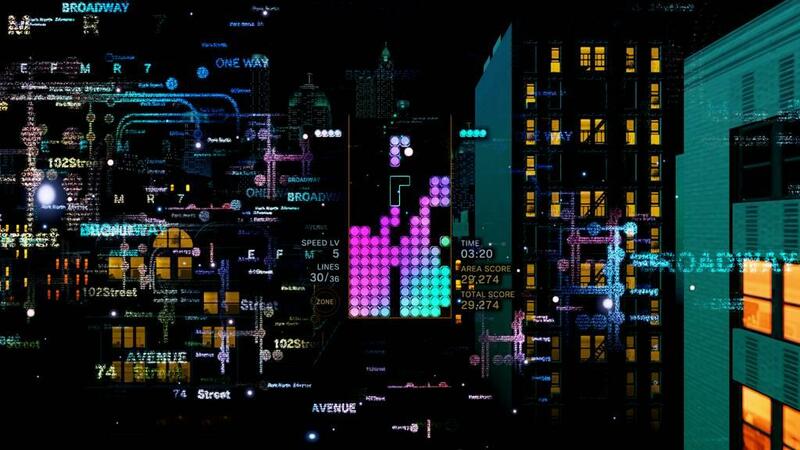 Tetris Effect the game takes the idea of fitting the pieces of your life together--and turns it into a visual and musical journey of fitting everyone's lives together. It takes the idea that everything in your world is connected, and starts weaving a story of how your world is connected to every other person’s world. 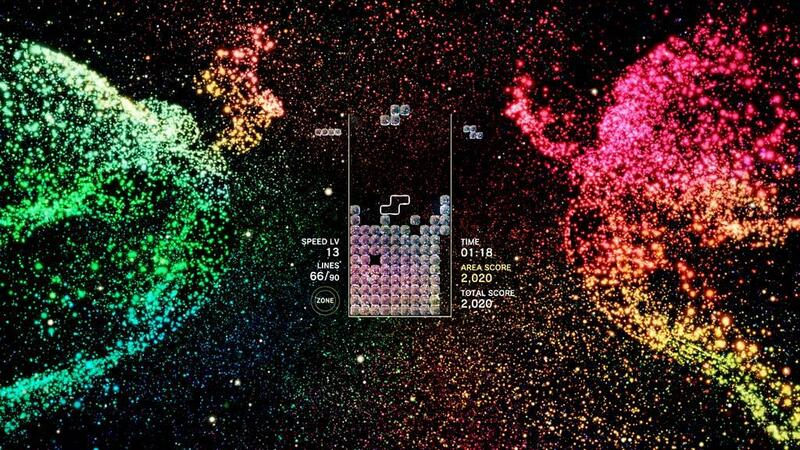 Tetris Effect takes the concave goal of putting everything into tight bundles of squares and, conversely, expanding it outside of itself, blowing out the borders of its own size and shape. Okay, let’s take a breath. 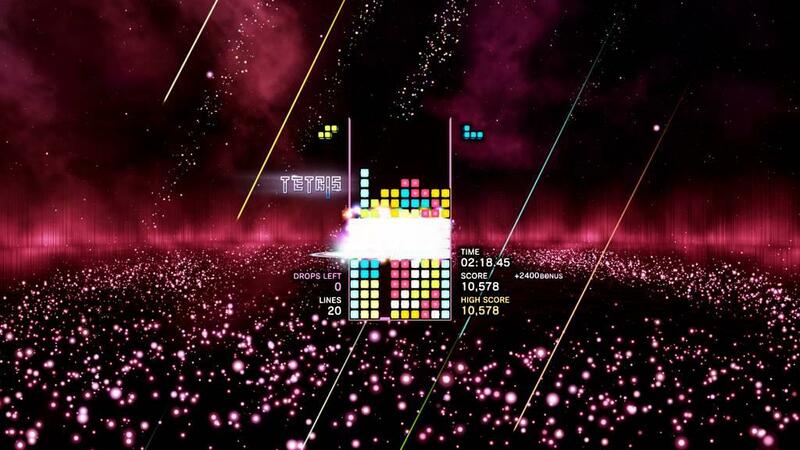 Tetris Effect, to be utterly reductivist and to miss the point, is just Tetris plus musically infused visuals. 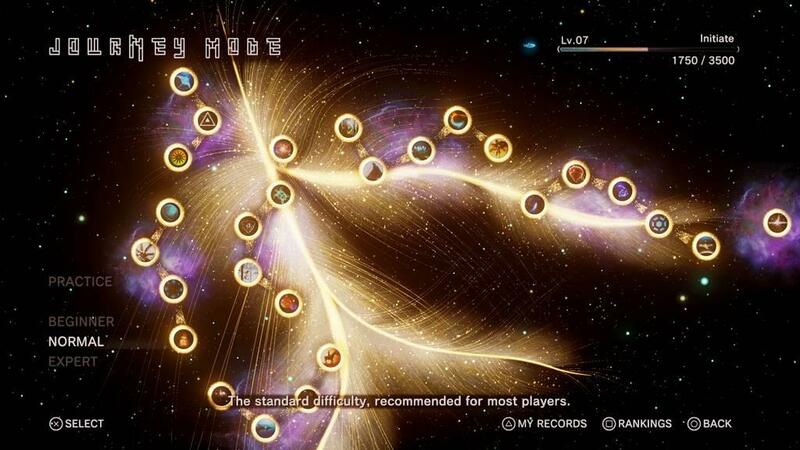 After playing the first stage of the Journey mode, you’ll even hear how the lyrics to the theme song make all of those “we’re all connected” suggestions. But the song is nice, and somehow, despite the airy vocals and trancelike music, it doesn’t come off as overly scripted or hamfisted. I like the theme song, what do you want me to say? 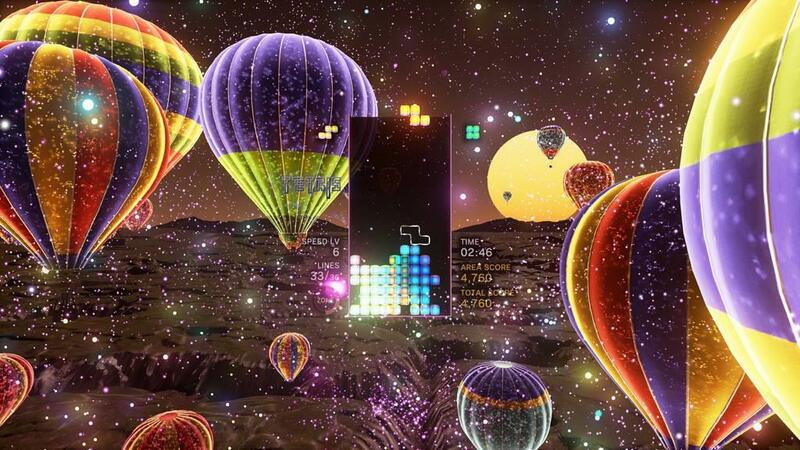 Another word you’ll hear bandied around a lot in regards to Tetris Effect is “synesthesia.” That’s when one sense in your body starts leaving an impression on a different sense in your body. Synesthesia absolutely belongs here and in any conversation about Tetris Effect. Especially since your movements--the spin of a tetromino, the clicking it into place--adds perfectly and musically to the soundtrack. Those same movements also spin and swirl and pulse their way into the visuals. The bioluminescence of a jellyfish will surge with your button presses. Windmills in the sky will give a clockwork jolt to its rotation. 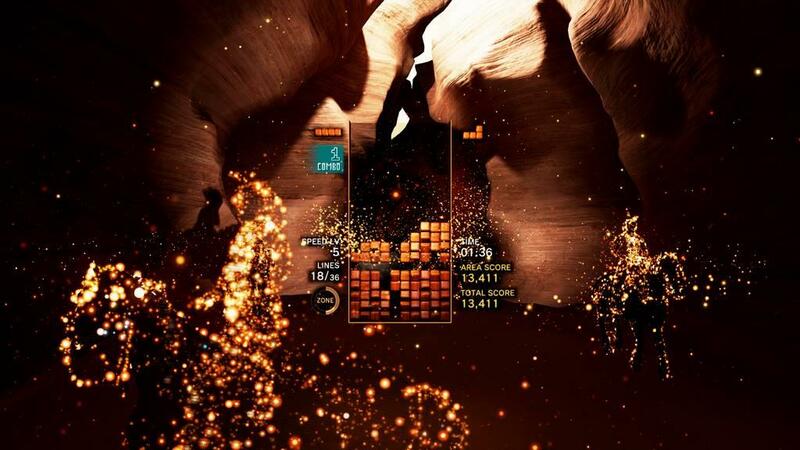 Or glowing sands will blow across a caravan of camels crossing a golden desert as you lock a tetris into place. 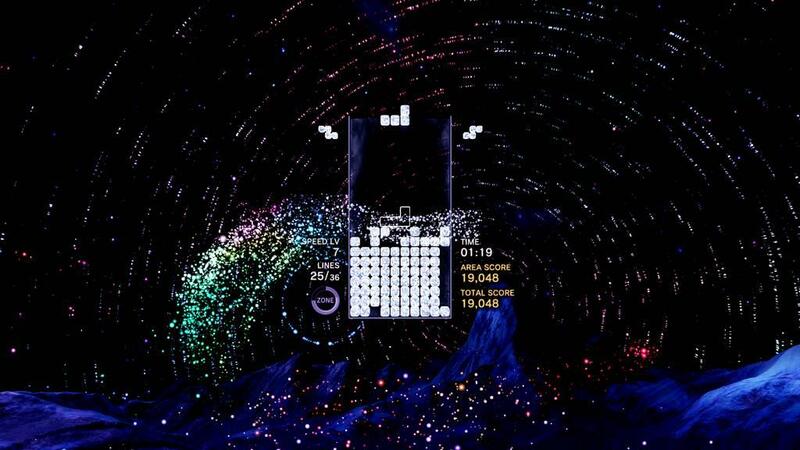 Anyone that tells you Tetris Effect is a completely chill experience is lying to you. Sure, it’s nice trance music. And yeah, the graphical storytelling in the background is pretty. But this game is not here to lull you to sleep or to slow your deep-breathing exercises. This game is here to make your gears grind in ways you’re unprepared for. At first, anyway. After you’ve traveled along several feathery branches of the Journey mode trail, a mode that takes you through a series of musical EPs, if you will, then things can occasionally get “chill.” But more often than not, it’s more like tackling the random hillclimb setting on a StairMaster workout. Some stages start of slow and then, after a requisite number of lines cleared, ramp up the speed of the falling blocks, and subsequently ramp up the speed of the masterful soundtrack. At other times, the stage might start off by dropping your tetrominos right off a cliff, not giving you even a moment to think about them, then, if you survive a couple harrowing minutes of that, taking a step back and letting you catch your breath. 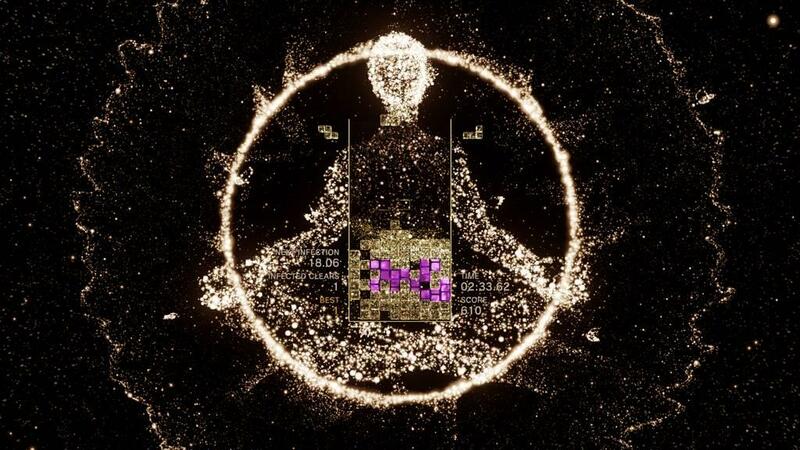 If a picture in Tetris Effect is worth a thousand words, I wouldn’t say “chill” is one of them. But you can get in the zone. Mentally and actually. When your muscle memory, mental acuity, visual clarity, and rhythmic intuition all come together in one accord--that’s when your brain is in the zone. There is a maneuver in the game, however, also called “Zone.” After you’ve built up your “Zone” meter by clearing some lines--probably with tetrises--then you can pull the controller’s trigger and activate the “Zone.” Time stops. The blocks stop falling on their own, and you can then place them all exactly where you want them without the time pressures of tetromino gravity. Interestingly, when you craft full lines in this mode, the game removes the blocks at the bottom of the page, rather than only at the exact tangent you created the blocks. It’s like a matching 401(k), because it clears the lines you’re making at the top, but matches your contribution by clearing that same number of lines from the bottom. Imagine Max Payne’s “bullet time” or Fallout’s V.A.T.S. system, but in Tetris form. 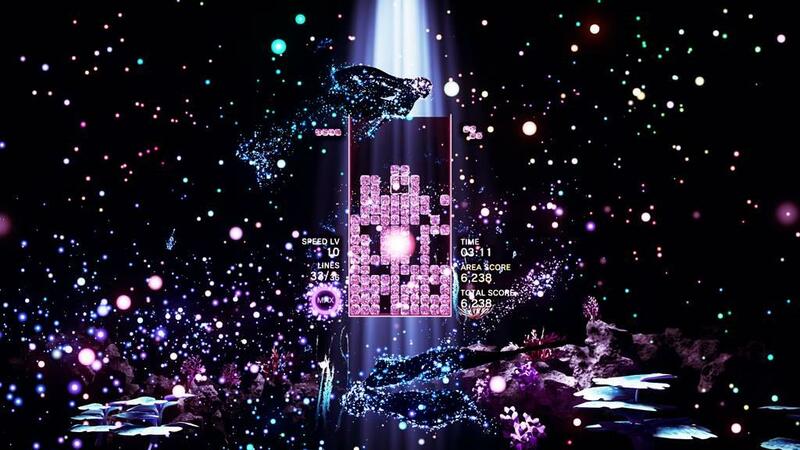 Sometimes, though, it feels like Tetris Effect is working too hard against itself. The ideal game world it wants to create is one in which the musical orchestration is married to the puzzle gameplay, and where the visual splendor breaking the borders of it all are at once registering subconsciously in your mind but simultaneously dancing just outside of your tunnel vision. But all of these things sometimes create a trainwreck in front of you. The wreck likely happens when you unplug from the matrix and are suddenly aware of each individual component at work. That’s when you stutter. That’s when you stumble. It’s like when a doctor puts a stethoscope to your chest and asks you to breathe normally: suddenly, you have no idea what normal breathing is like, simply because you’re now overthinking a process that doesn’t (usually) require conscious thought. 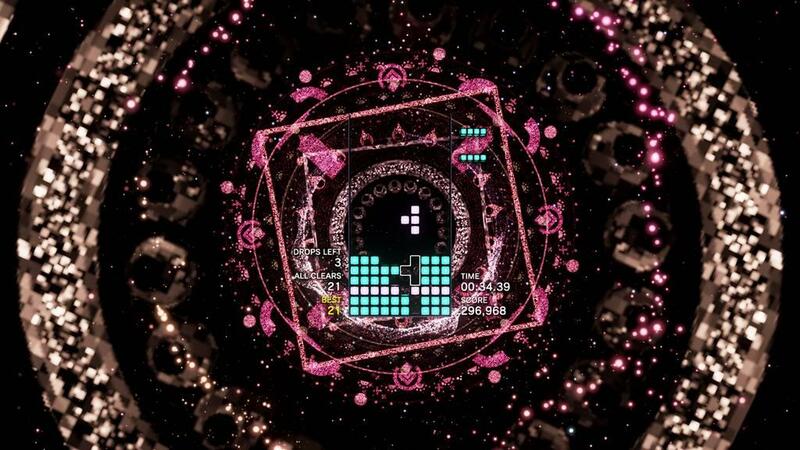 The fact of the matter is, I am able to play my best rounds of Tetris Effect with the music turned off. If I mute the mayhem, suddenly stages that gave me nothing but a D for a finishing grade were suddenly giving me C’s and B’s. I might’ve even nailed an S grade or two, and I don’t even know if there’s an A. I don’t like playing Tetris Effect muted. Seems like it’s not in keeping with the spirit of the game’s intent. 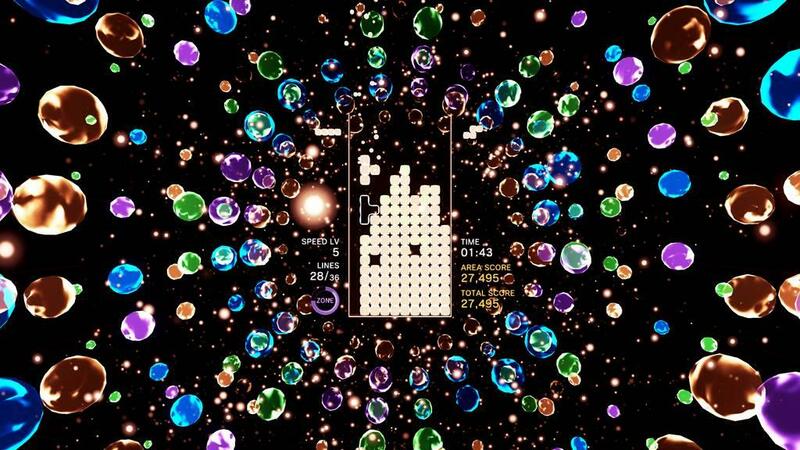 But so often it seems like Tetris Effect is keeping the player dazzled with an overstimulating package. Silence the synesthesia, and you will unintentionally unlock an easy mode. That’s too bad. Like I said, though, I’d rather take a lower grade and a fuller experience than a higher grade for an amputated one. 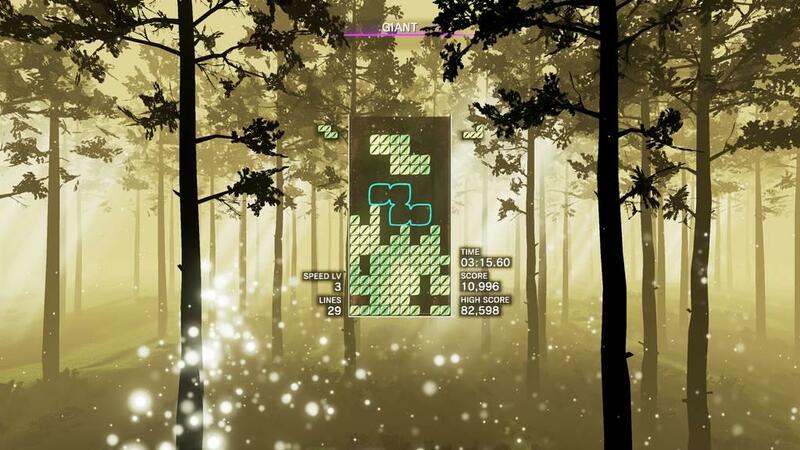 At the same time, that’s the brilliance of Tetris Effect. It takes its own metaphor of orderly living and flips the script. It’s the theatrical twist nobody saw coming. The introduction of so much beautiful chaos is what emphasizes the standard game’s brick-by-brick precision. It takes your systematic way of existing and turns it on its head. And it works. That’s why people are freaking out about Tetris in the year 2018.